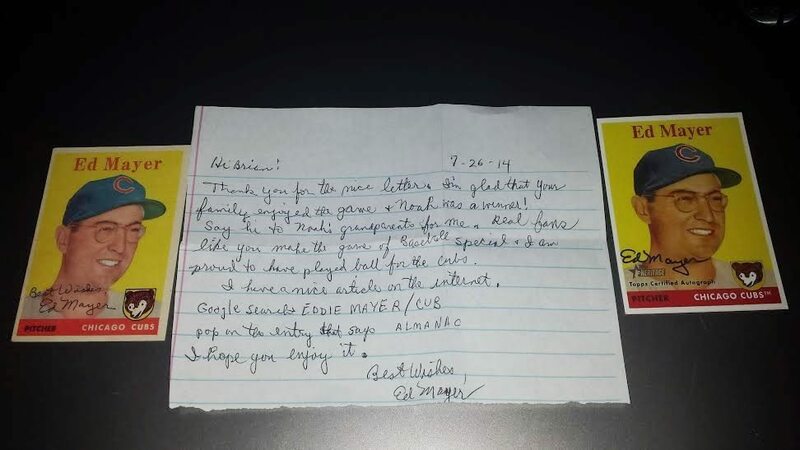 “I wrote to Mayer asking for a signature on his 1958 Topps card because he threw out the first pitch at my four-month-old son’s first game at Wrigley Field. Not only did he sign the card, but he sent the letter pictured in the attachment. “Thank you for the nice letter. I’m glad that your family enjoyed the game and Noah was a winner! “Say hi to Noah’s grandparents for me. Real fans like you make the game of baseball special and I am proud to have played ball for the Cubs. “I hope you enjoy it. When I wrote about Ed Mayer back in 2010, sharing his letter, I learned he was a former teacher, too. I love the lesson the ex-hurler delivers, a lesson for all of us. Brian’s example shows that a personal letter matters. You won’t always get such a class response as what Mr. Mayer sent. However, you’ll land the former player’s major league effort when you share of yourself. Additionally, the Ed Mayer victory for Brian unlocks the secret of the hobby. The thrill won’t come from a price guide. Sharing the stories behind the signatures: that truly matters.